Earlier today, John mentioned that one of the markers of knowing if you're really seeing some someone is you feel like you're bursting in a thousand pieces. I can tell you, I am seeing you, because I feel like I'm bursting into a million pieces. I first breathed in ServiceSpace last year at this exact event. I don't know how I got here, but I was so excited to be invited. It was the most incredible night I have had, I think truly, ever. Since then, I have been blessed to experience two Laddership circles, a Karma Kitchen (which was just beyond! ), a kindness Awakin circle, and I got to have Anne Marie and Audrey come to my playground -- a middle school where I teach. I remember after my first Laddership circle, being so inspired, and thinking, "God, why did it take me so long to figure out that this is what it is all about?" I'm like, "I'm almost 50. That is way too long." It hit me like a ton of bricks -- "I have to teach a class on this." It's not really teaching, because anyone who is a teacher knows that your students offer so much more than you can teach. But it just started to get my wheels turning, and I thought, "I have to offer this class. I have to." I started crafting the class, based on Laddership principles and Karma Kitchen ideas and Karmatube content. Then, I brought it to my principal, back in January. He must have seen my passion and the stubbornness, that I was not going to take no for an answer. :) He approved the class and put it in as a 7th-grade enrichment class. Twelve and thirteen-year-olds is a good age for these values. We start school on Monday, and I'm going to be able to have three groups of kids in a trimester setting. We will be crafting a trimester of laddership! I remember, after all of our Laddership readings and such, I would bookmark them constantly -- and now I can share it with the kids at school. I'm calling the class, Service Innovation. The kids will be ambassadors. Our school already built around this culture of kindness and service. We do community service assemblies three times a year, to honor and recognize kids who have met or exceeded their community service hours, or stand out from the community or inspire other kids. Last year at this time, I was so energized by these values that I created a "wheeeeeel of kindnessssss". 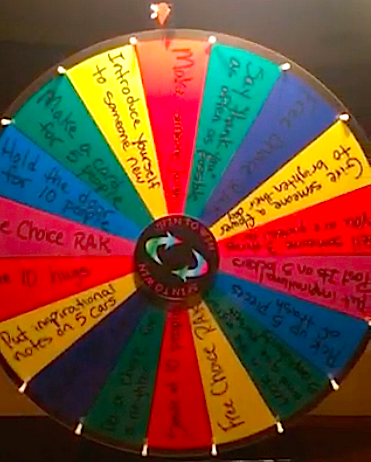 It's like a Wheel of Fortune carnival wheel, and our kids do a live broadcast every morning. On Wednesdays, because we have a block schedule, the principal and vice-principal do the broadcast. They spin the wheel of kindness every Wednesday, and see where it lands. It might be, “Give ten high-fives,” or "Smile at four people today." Then as the year went on, I was like, "Our students need more of this I-am-enough message." So I would put in ideas like, "Look at yourself in the mirror, and tell yourself you're awesome." Wherever it would land, we have an advisory class on Mondays and that would be the opening icebreaker. "Okay, how many of you did the wheel of kindness?" Given that history, the Service Innovation class was an easy sell to the principal, because it really is rooted in everything that our school believes in. The kids will be discussing different topics and reading articles. My first one is actually on gift ecology. We're watching videos and skyping with people. Natasha said that she'll skype with us from Dubai. I've contacted Jacob, and I'm like, "You have to skype with my kids." The ServiceSpace community has been so important and magical, and amazing and guiding in my life, and I want to share it with the kids at a younger age. They don't have to wait so long to feel this. After the class, their final exam is going to be a Karma Kitchen situation where they will have to plan and put on a community dine-and-donate situation. We'll choose three of the projects that they've come up with, to disperse that money to. I can promise you that when the kids walk into my class on Monday morning, the first time this Service Innovation class has ever been offered, that I will see them, and I will honor them, as you have seen me and honored me for the past year. Wow Melissa this is amazinggggggggggggg!